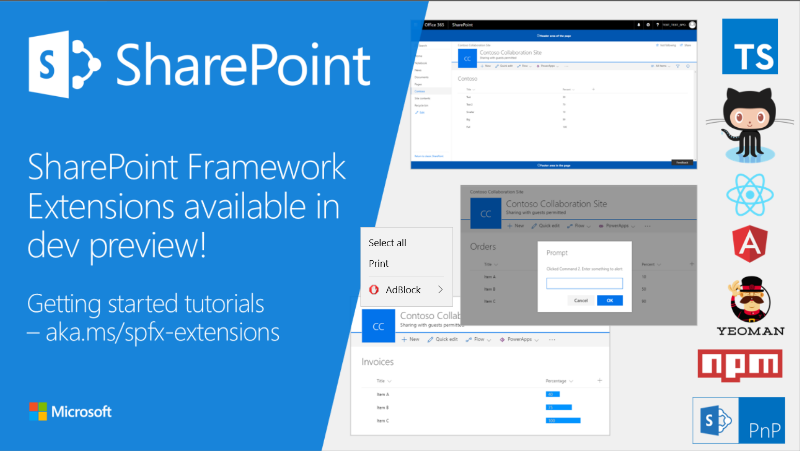 Today the Office Team announced the availability of the SharePoint Framework Extensions Developer Preview. With this you can build site, list and command extensions. To start building your own Extension Preview projects you can go and start looking at the Preview documentation. If you don’t already have an Office 365 Developer Tenant you can get one if you go to the Office Developer Program so there is no argument not to start using that. The preview is obviously meant to serve as a way to collect feedback from the community and while the preview is running you can expect new SharePoint Framework Extension capabilities and changes based on your feedback. If you want to provide your feedback you can do this by adding issues to the GitHub issues list but on the SharePoint tech community, the SharePoint Developer section on the Microsoft Tech Community site. 1. 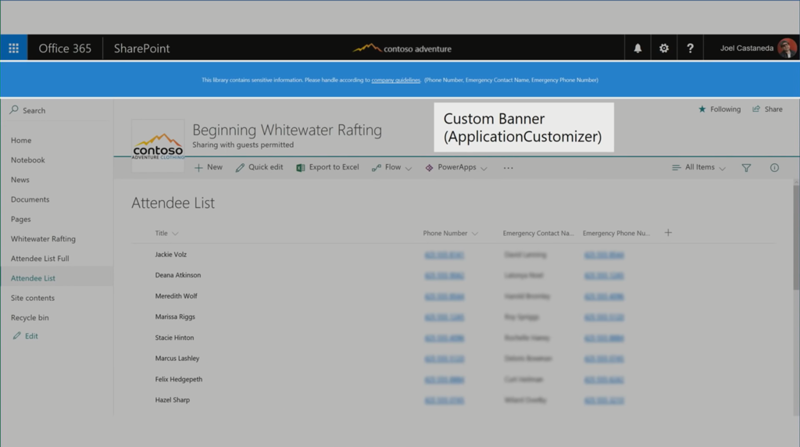 Build your own Custom Banner using the ApplicationCustomizer. Adding a Custom Banner is now one of your options to build your own banner with exactly the information you want to share on your list page. 2. 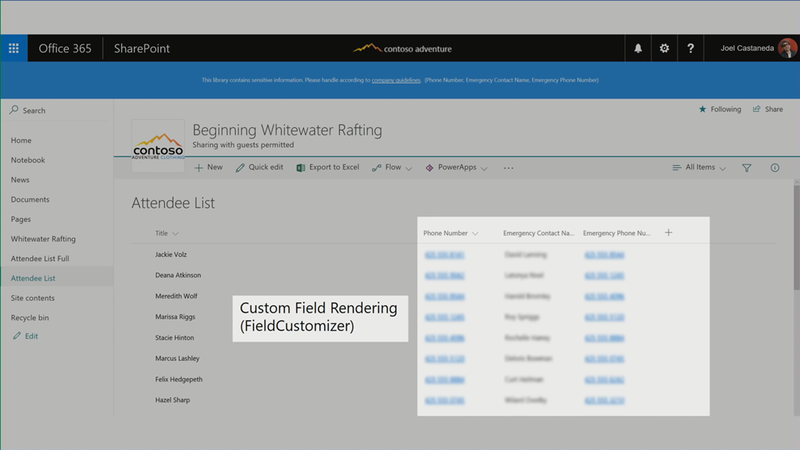 Create your own Custom Field Rendering using the FieldCustomizer. In this example you see that the fields of the list are blurred to hide sensitive list information. With this option you can add your own custom menu actions to be able to trigger your own custom actions. If you are looking for more examples (extensions examples will be added soon) for what you can do with SharePoint there is a special SharePoint Showcase site for you to look at and to enjoy all the great options and examples. 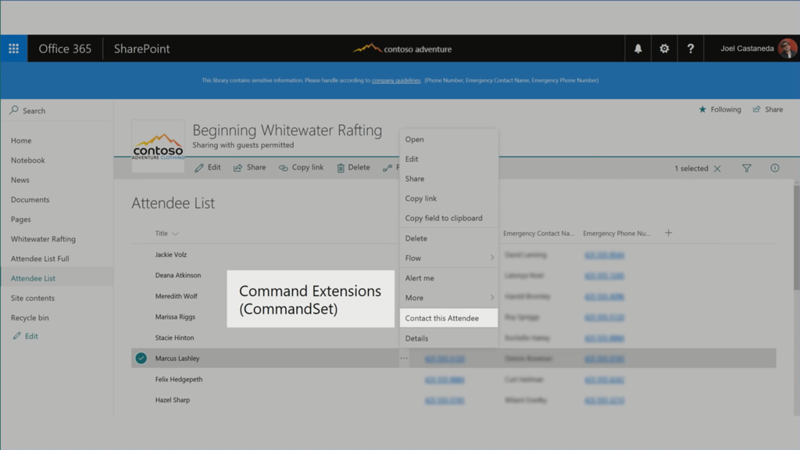 Now go ahead, and build your own Extensions using the SharePoint Framework Extensions Developer Preview!